There are, especially recently, an abundance of articles out there talking about mothers' and body image, how mothers see themselves is usually passed onto their daughters and ultimately affects how their daughters see themselves. The article usually links the struggle to adapting to their postpartum bodies to their thoughts on body image. I get it. I'm another one wading in the pool of learning to love my appearance. My weight has fluctuated over the years. My acceptance of my body image fluctuating along with it. Throughout my high school and college years, an indecisive thyroid and intense reaction to gluten and processed food resulted in a selection of jean sizes ranging from 2-12. And when I finally seemed to get a handle on all that internal chaos, when my weight leveled out, when I was comfortable in my skin, and when my wardrobe for once housed a consistent size, I got pregnant. I gained 35 pounds. My chest quadrupled in size. My feet swelled. After pregnancy, I dropped 26 pounds. My hips remained wider. My chest didn't experience the same downsize. My feet went mostly back to normal. Then I got pregnant again. New stretch marks, new sizes, more weight in different places. Through all this, the mirror's been a sort of enemy. I get dressed, take a peek, and I'm reminded something doesn't fit right anymore, or I need some Spanx-like slip that I don't have, and I sigh and head back to my closet often repeating this dance. Only now there's a difference. There's something at stake when I walk over to the mirror. 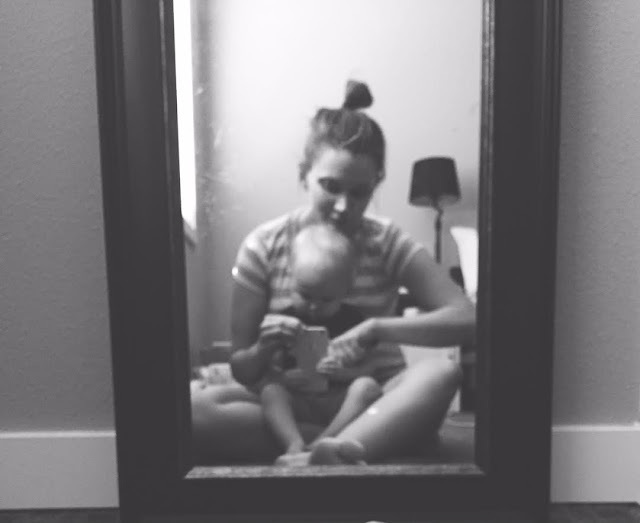 The difference now is that I have a daughter who loves the mirror. She's fascinated by the thing. I will step in front of it, and not long after I will find her standing sideways looking at her reflection, sticking out her belly, making a funny face, or putting her face real close and promptly laughing. My reaction to my reflection in the mirror matters to her. If I want to teach my daughter that she is enough, that she isn't defined by or her confidence isn't a by-product of flaws or a lack-there-of (which is one of my life's missions), I first need to hold that belief. Lately, mostly thanks to Brené Brown's Daring Greatly, I've practiced this mindset when getting ready. I try to no longer view the mirror as an opponent but as something that reveals an image to be proud of. I'm not perfect. Some days, my sigh is louder than it should be, some days I want to arm myself in all things Spanx, but I'm learning to walk up to the mirror, usually with Ella waddling behind me, and say, enough.